Just how bad is it in the LA Galaxy organization right now? Bad enough that some heads could roll after yesterday’s surprising loss on the road to expansion side San Jose. As we’ve seen before things are too peachy with General Manager Alexi Lalas and head coach Ruud Gullit. It seems as though now days Gullit and Lalas are not getting along too well. Big shocker huh? I talked about it last week that Lalas’s job was probably entering it’s final hours. After yesterday’s loss the Galaxy are quickly playing themselves out of the playoff picture. Its not that the offense isn’t working, no its still the same issues in defense and in the defensive part of the midfield that are causing the most problems. 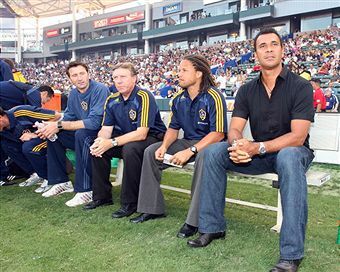 With a big match against rivals Chivas USA looming in the distance, is it time for someone to get the boot in Hollywood? I can’t see it being Gullit here, so that would have to mean Lalas right? Or will this club finally step up and address the one need that they really need, a defensive midfielder? The same question has to be asked of if they are going to trade Carlos Ruiz or not here soon. Honestly, a move that could happen based on money and overall need for two clubs is a trade with Colorado for LA. Trade Ruiz to the Rapids and get Pablo Mastroeni in return. I know Mastroeni is looking to go elsewhere after this year or hell even right now but this is a deal they both should make. Ruiz adds some much needed fire power to the Rapids who have been largely inconsistent in that department all year. LA gets their biggest hole filled by Mastroeni in the defensive side of the midfield. Its a trade no one has talked about yet but its one that needs to happen. Call me crazy if you will but it could save a couple jobs if everything works out. What do you all think will happen here? Some trades, some firings? What? Is it possible to trade AEG and Lieweke? That's the biggest part of the problem. Lieweke keeps sticking his nose in where it shouldn't be and insuring there is no stability with the team. Look how long the successful teams have kept their organization pretty consistent. All this constant changing of staff (and direction) is the bulk of the problem in LA and the finger should be pointed at the ownership group and Lieweke in particular. Your comment right below the heading is hilarious Drew—talk about LOL! As for that trade, I would do it in a second. Mastroeni is the type of player the Galaxy need, and I could see Ruiz thriving with the service he would get from Clark, Gomez, and a good passing stiker in Casey. Do the deal! Is it possible to trade AEG and Lieweke? That’s the biggest part of the problem. Lieweke keeps sticking his nose in where it shouldn’t be and insuring there is no stability with the team. Look how long the successful teams have kept their organization pretty consistent. All this constant changing of staff (and direction) is the bulk of the problem in LA and the finger should be pointed at the ownership group and Lieweke in particular. Lalas may not be the only problem, but he is the biggest reason for the team’s lack of success, and things won’t get better until he is gone. His personal moves are ridiculous (and too numerous to mention! ), and I blame him for the instability, not AEG. AEG is an ownership group that is wiiling to spend money and succeed, but Lalas doesn’t know what to do with the resources he has! Lalas must go!!!! Gullit is a coach who is still learning MLS and how to deal with American players, but his soccer IQ is undeniable. People are critical of his line-ups and moves, but I think he is trying to find an effective line-up in the bad hand Lalas has dealt him, and he usual makes great adjustments at halftime, which makes the Galaxy a better 2nd half team. Gullit should stay!